You are currently browsing the Gluten Free For Good blog archives for May, 2009. If it’s not pharmaceutical drugs being advertised on TV, it’s natural supplements being pushed in health magazines. If you want to feel old and rundown, watch Jeopardy or Wheel of Fortune and take note of the advertising. Everything from cholesterol lowering drugs to denture paste to laxatives to viagra. It’s not much better in the magazine world. Unfortunately, that says something about our general state of health in this country. “A rich source of fiber,” grapefruit pectin “may help maintain cholesterol levels already in the normal range.” All that for only $31.98 a bottle. Hmmm? Let me get this straight. You can keep your “already normal” cholesterol levels “normal” by taking grapefruit pectin supplements. Here’s an idea. 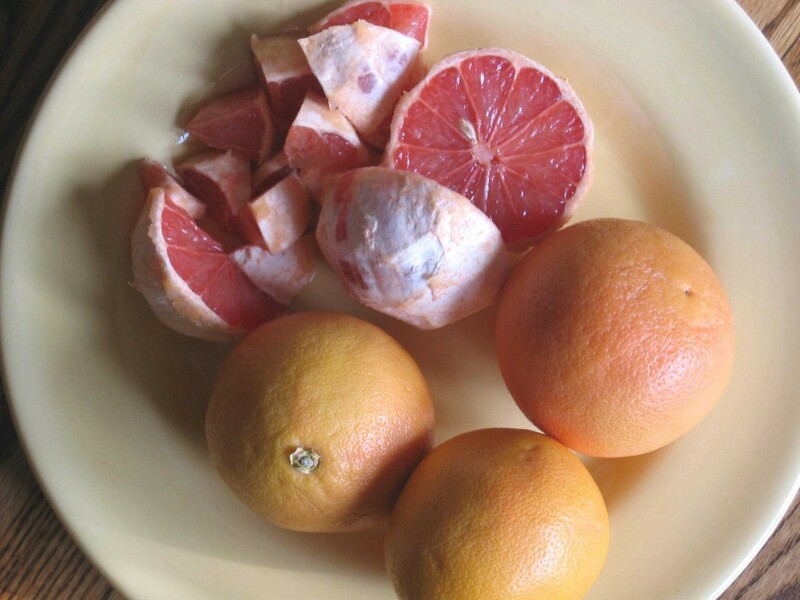 How about we skip the supplements and eat real grapefruit? I’ll admit, I’ve fallen for some less-than-good-for-me health food claims in the past (of all things, wheat germ) and I do take a few supplements from time to time, but my gosh, we’re getting bombarded with over-the-top health claims these days. What’s true and what isn’t? The US Food and Drug Administration recently put the smack down on General Mills for claiming that Cheerios have been “clinically proven to lower cholesterol.” Oops, the FDA says those words classify Cheerios as a drug since the intent is to prevent or treat disease and as such, they need to go through the “approved new drug application” process. If you can’t believe in Cheerios to lower cholesterol, can you believe in grapefruit pectin? Maybe, maybe not. I believe in the healing and medicinal properties of whole foods, but I’m not buying into advertising claims applied to food that comes in a box. I’m also not buying into the pectin supplement claims, but I am a huge fan of fiber and just in case the pectin can work some magic somewhere in my body, I leave as much of it on my citrus fruit as possible. See above for pectin-saving peel photo. I use a small paring knife and keep as much of the fibrous membrane on as possible. Start with the mustard and place all ingredients in a small jar. Shake vigorously. If you start with the mustard, it won’t separate. Use as needed for any salad. Assemble salad, sprinkle with pecans and goat cheese, drizzle with dressing and enjoy. * I like toasting my pecans in a dry skillet on medium/low for 3 to 5 minutes to bring out the flavor. Go forth and eat whole foods, pectin and all. This is a photo I took of a well-worn benchmark atop a peak in Colorado’s highcountry. 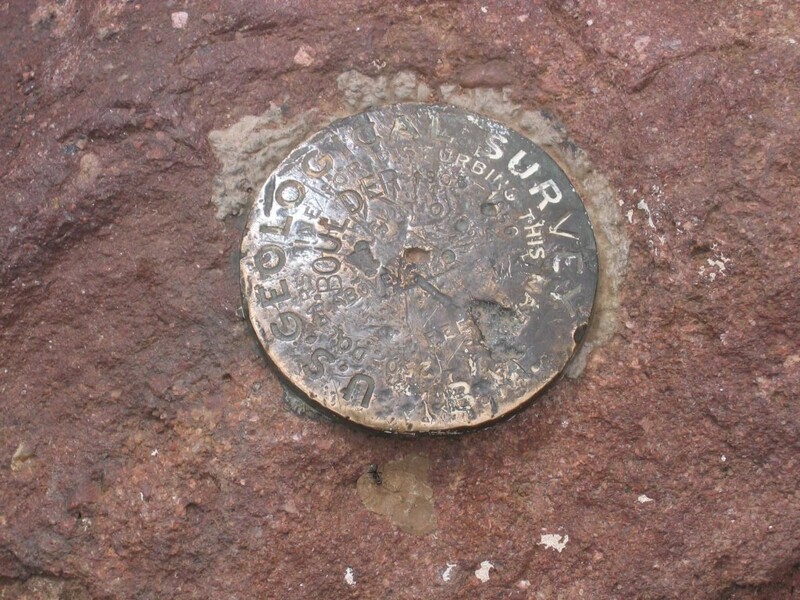 Benchmarks are U.S. Geological Survey summit markers and are found on the high-points of many of our mountains. They document the elevation. I spent yesterday out in the backcountry, energizing my body and reloading my spirit. There’s nothing like a day in the mountains to diffuse everyday stress and shift things back into perspective. Nourishing the soul is just as important as nourishing the body. Sometimes the higher you go, the better the weather. Yesterday was foggy, rainy and cool. Perfect hiking weather, but the clouds were low and thick, obstructing the view until we were above them. 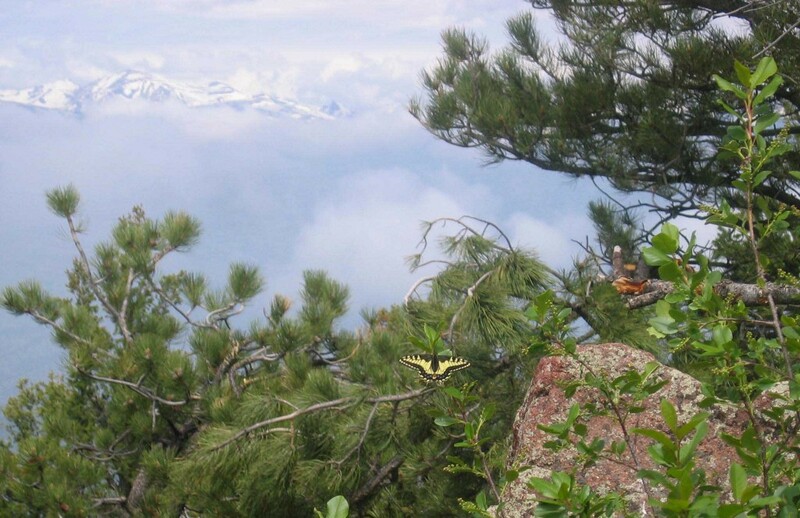 If you look closely at this photo, you can see a range of snow-covered mountains in the distance and a beautiful butterfly in the foreground. I’m thinking this might be a Western Tiger Swallowtail butterfly, but I don’t know. If anyone knows, please leave me a comment. Now, on to the other good stuff — trail food. How about the best of all worlds? Breathtaking views, butterflies and chocolate truffles? I’m such a girl. Although I’m not exactly Backcountry Barbie, I do have my moments, especially when they involve butterflies, flowers and chocolate. I make different versions of these little power balls and cart them around with me on day hikes. They’re a touch smaller than a golf ball, freeze well and make for a good power snack. I pack two or three of them, along with the rest of my lunch, in a small tupperware container to keep them from getting squished. Sometimes (especially when space is tight) I pack my food in an empty tea box or something similar. That way the food stays intact, but when lunch is over you can collapse the box and stuff it down into your pack. Pit and chop dates. Place in small bowl and pour the orange juice over the dates. Do the best you can to cover the dates without adding more juice. Set aside and let soak for 30-60 minutes. Pulse pecans in food processor until finely ground. Add stevia and cocoa powder to dry blend. Pulse and mix well. Add mejool dates along with the orange juice they have been soaking in, almond butter and peppermint extract and pulse food processor after each addition until mixed well. 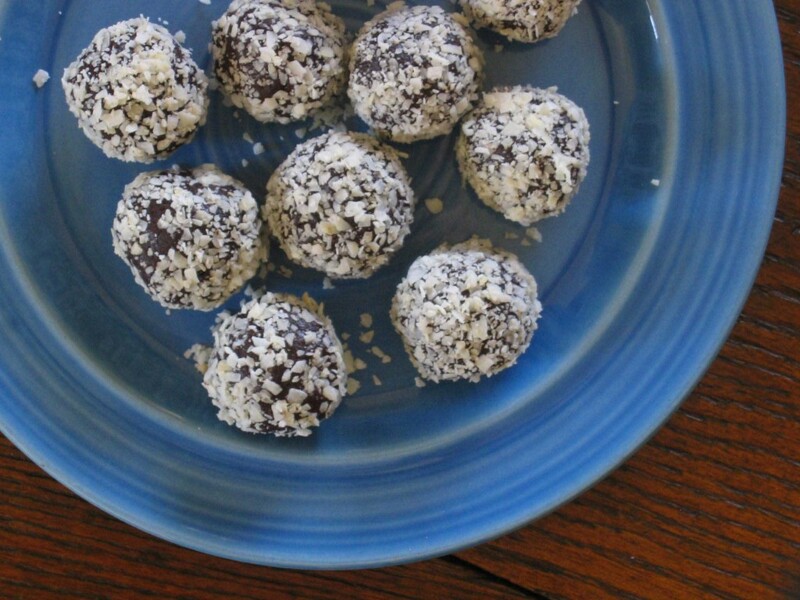 Roll into balls and dip in ground coconut flakes. Refrigerate or freeze. * I like Dagoba organic cocoa powder, but substitute as you choose. * Stevia blends well in this recipe, but you can substitute another sweetener. I’ve used maple sugar before, not maple syrup. Honey and syrup make them too sticky. * For a more detailed post I did on backcountry nutrition needs, check here. Go forth and explore, but eat good food in the process! That quote is from legendary culinary queen, Julia Childs, but the thing I love most about it is that applies to so many aspects of my life. It’s a personal mantra of sorts, from farm-fresh food to outdoor adventure to family and friends. Yes, life should be all about trembling with joy! I don’t advertise on this blog, but I do advocate healthy living and a huge part of that is a focus on nutrient-dense foods. Because I have celiac disease and want to avoid the pit-falls that often accompany autoimmune conditions, I choose high-quality, organic foods and steer clear of the vitality-zapping junk that makes up the Standard American Diet (very SAD indeed). Those of you who have been following this blog know I support my farmer friends at Grant Family Farms. I thrive on their organic fruits, veggies and pastured eggs and as a nutrition therapist, I know exactly why. It’s my medicine (lucky me). Nothing like fresh garlic scapes sautéed with summer squash, served with wild rice and a few ounces of wild-caught salmon for a dose of healing flavor. Or fresh, omega-rich eggs that look and taste much better then their store-bought counterparts. There’s no comparison. So, while I don’t advertise on my blog, I won’t hesitate to encourage you to jump on the “eat healthy and eat local” bandwagon. For those of you in Colorado, please check out Grant Farms as they’re now delivering to the mountain communities. Yippee! From Dillon to Winter Park to Steamboat Springs to Leadville, Fairplay and Buena Vista – Grant Farms will bring organic goodies right to a drop-off location near you. For more information and to sign up, check here. Okay, so I have ulterior motives. It’s about that tremble with joy thing I started with. Every Tuesday during the 26-week harvest season, I’m inspired by what I find in my big red CSA delivery box. Inspired to play with my food, strengthen my body and nourish my spirit. Food can do that, especially when you know it has been grown with love right up the road from you. Bottom line? I want my local farmers to be successful! I actually need them to be successful. My health depends on it. Go forth and hug a farmer – then tremble with joy! Miles, my favorite blogging chef recently published a post extolling the benefits of grinding your own spices (along with a recipe for curry). I’ve been following his blog for quite some time now and because of his influence, and the fact that he patiently answers my food questions (thanks, Miles), I’ve purchased my own spice grinder and pestle and mortar and I’m learning the nuances of what fresh spice or herb to use and when. Plus, if I start from scratch with a cumin seed and not a blend of spices, I know exactly what I’m eating. No possibility of gluten cooties. When you have food issues and an assortment of ingredients are off limits, learning the fine (and not-so-fine) art of culinary experimentation becomes all the more important. Without getting too sappy, I’m lucky to have an innate interest and love for high-quality and nourishing food, making my gluten-free journey a gift and not a burden. I actually find it fun. This recipe is an expression of my growing interest in spices and herbs, which by the way have all kinds of healing properties. So, let thy food be thy medicine and thy medicine be thy food. 1. Cook squash in large pot of simmering water until knife tender (it won’t take long, maybe 5 to 10 minutes). Add raisins during the last minute of cooking. Drain and rinse with cold water to cool. 2. Whisk together lemon juice, EVOO, garlic, honey, salt, cumin, cinnamon and cayenne in large serving bowl. Add squash, raisins, apple, cilantro and pecans. Toss lightly to coat. Serve at room temperature. Adjust the dressing as needed. This may be too much or too little for your taste. * Butternut squash is good in this recipe. You can also use sweet potatoes. * I almost always use Fuji apples, because I’m addicted to them. Seriously addicted. * I’m grinding my own cinnamon and cumin, but the pre-ground version is fine. Cinnamon helps keep blood sugar levels balanced and works as a circulatory stimulant. It’s also a carminative (fancy word for helps reduce gas and bloating). Cumin has been used in Ayurvedic healing for thousands of years. It stimulates the secretion of pancreatic enzymes, aiding digestion. Go forth and spice up your food! This is a multi-faceted post — euphemistically speaking. Actually, it’s several threads that don’t really go together, but I’ll press on anyway. My last post elicited several responses about using beet greens. Aside from the random commenter who admitted tossing the greens away (yikes) and only using the beet root, I also received 1 phone call, 3 emails and a scattering of real-time comments from friends who had no idea people actually ate the greens. I won’t mention any names, but one of you is a complete beet virgin, root and all. I love all greens, but beet greens are a favorite because the texture is so delightful. For a post I did on the comparison of collard greens to rubber gloves, check here (recipe included). Don’t get me wrong, I love collard greens, kale and the other hearty greens, but beet greens are my favorite because they’re more delicate and the magenta and green colors add an artistic flair to your table. I don’t do any advertising on this blog and for the most part, I don’t advocate anything other than healthy living, good food and friendship. Today I’m going to stray from that a bit and mention a cookbook I have, along with a beet green recipe from the book. Every room in my house is full of books. Buying books is my downfall. I’m addicted, seriously addicted. Many of my books are cookbooks that I have never used. But this is a book I not only cook from, I read it in bed. It’s called Outstanding in the Field by Jim Denevan, whom I’ll admit, I have a mild crush on. But the book is worth drooling over, whether you ever cook from it or not. If you don’t know who Jim Denevan is, take the time to watch this video. This is a table to farm cookbook, rather than the other way around. Jim is a surfer, artist, chef and visionary who brings his dinner guests to the food — right in the midst of the garden or field. 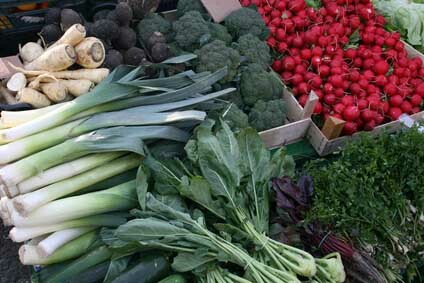 You can’t get any fresher or more local than that. Wash beet greens. Remove stems and chop into a small dice. Coarsley chop the leaves and set them aside. Heat 1 tablespoon of the olive oil in a heavy-bottomed skillet over medium-low heat. Add the chopped beet stems and a pinch of salt. Cook, stirring occasionally, until the stems are nearly tender, about 8 minutes. Push the beet stems to one side of the pan and add the garlic to the other side. Cook until fragrant but not brown, about 1 minute. Stir the garlic into the stems. Add the chopped beet leaves and season with salt. Stir in a splash of water and cook until the leaves are tender, 8 to 10 minutes. In a small bowl, whisk together the lemon juice and 3 tablespoons olive oil with a pinch of salt. Remove the pan from the heat, pour the dressing on top, and stir to combine. Season with salt and pepper. Serve hot. Pick your plate and be inspired! If I had to pick my favorite vegetable, it would probably be beets. Roots, stalks and leaves — I love every part of the plant. The vibrant colors just add to their charm. For detailed information about the health benefits and some off-beat bathroom science about beets, check this past post I did on the subject. This may sound a bit obsessive, but I eat fresh beets (never canned) in one form or another almost every day. I’m not sure which part I’d call my favorite — the root or leaves, as both are delightful for different reasons. If you’re tossing your beet greens in the compost pile, or (don’t even tell me) the trash, you can stop doing that right now. Beet greens are mild, tasty and full of healthy goodness. They can be used in the same way you’d use kale or spinach, lightly sautéed (my favorite) or steamed quickly. I don’t peel beets, as the skin contains fiber and trace minerals and protects other beneficial nutrients from seeping out. Plus, there’s less mess from the color “bleeding” when you keep the skin intact. To store, cut off the stems and leaves about an inch or so above the root. Store greens in the refrigerator for 2 or 3 days. The greens don’t last long, so use them quickly. The roots store well on their own (in the refrigerator) for much longer periods. 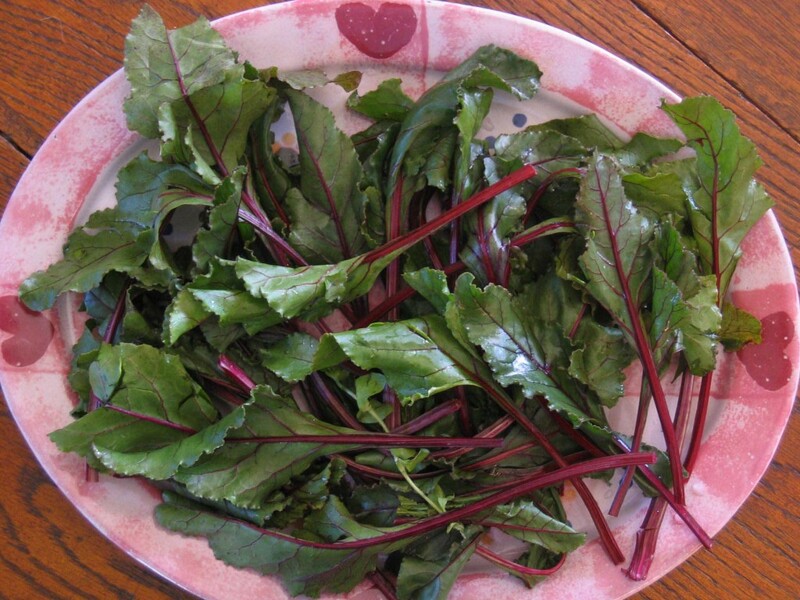 Scrub beet roots and grate, shred, or use a potato peeler to add to salads. Cut in matchstick strips and mix with jicama, pear, apple and/or carrots for a wonderful crunchy raw salad. Beet roots can be roasted, steamed or sautéed. Roasting beets brings out the sweet earthiness; serve warm, or cool and save for adding to salads later. To roast — cut the stems and greens off about an inch from the root. 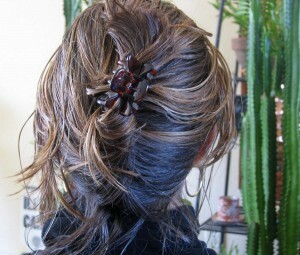 Scrub roots, pat dry and toss with a small amount of oil. Place in a baking dish, add an inch or so of water, cover with foil and bake at 375 degrees for about 45 minutes depending on size. Wash beet greens, pat dry. Chop stems into 1 to 2 inch pieces. Coarsely chop greens. Heat 1 tablespoon of coconut oil (or olive oil) in medium-sized skillet over low/medium heat. Add 1/4 cup diced onions and beet stems, stirring occasionally for about 5-8 minutes. Add 2 finely minced garlic cloves and continue stirring until lightly browned. Add a splash of broth (vegetable or chicken), the beet greens and a cup or so of cooked brown rice, stir gently and sauté until leaves are tender and rice is heated thoroughly. Add broth as needed to maintain moisture. Season with sea salt and freshly ground pepper. Skip the rice if you just want sautéed greens. I’m shifting from food to altitude to sophisticated blog posting from the highest mountain on the planet. First a short altitude 101 lesson to create the appropriate ambiance (pun intended). I took the above winter mountaineering photo from the summit of Drift Peak, high in the Tenmile Range of the Colorado Rockies. 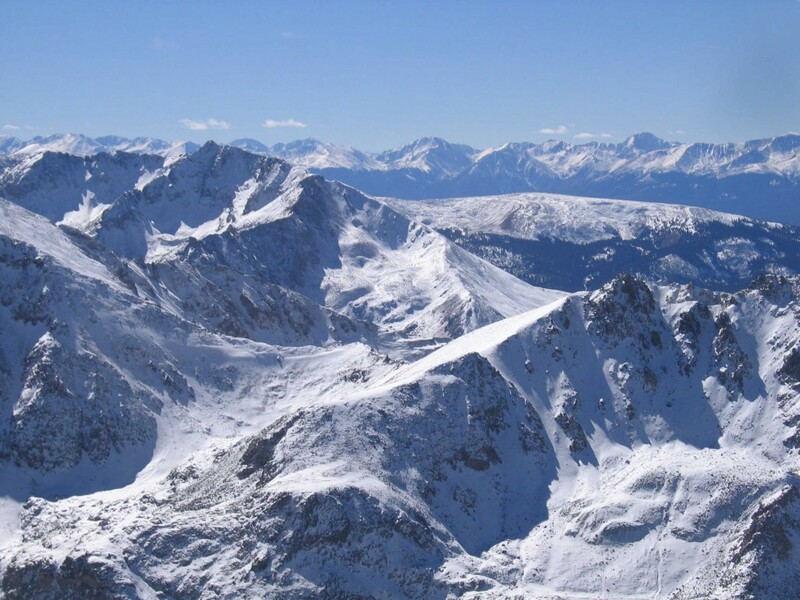 Drift Peak is a little over 13,900 feet, making it one of Colorado’s centennial peaks (the 100 highest summits, all over 13,800 feet in elevation). If you’ve ever wandered around at high altitudes (above 10,000 feet), you know that as you ascend it becomes more and more difficult to do anything in a hurry. Your legs feel heavier, your respiration increases and you might even feel nauseous or develop a headache. That’s because you’re not breathing in enough oxygen and the consequences can go from mildly annoying to life threatening. I won’t go into too much detail, but the higher you go, the more the body has to adapt to less air pressure, therefore less oxygen intake. Here’s where it gets confusing. The percentage of oxygen in the air is the same whether you’re at sea level or on top of Mt. Everest, which is 29,000 feet. Our atmosphere is made up of 21% oxygen at any altitude. There isn’t less oxygen as a percentage of gases at 29,000 feet, it’s just that the higher you go, the less atmospheric pressure there is. With less air pressure the oxygen molecules scatter into a larger volume of air. If I’m standing at sea level that same 21% of oxygen molecules is being pressed down around me so it’s much easier to breathe and get the oxygen I need to do whatever it is I’m doing. Our bodies do adjust somewhat and depending on our individual physiology, we adapt and acclimatize to varying degrees. To begin with, our breathing increases and our movement slows down. Heavy breathing (the altitude-related kind) allows us to take in more oxygen and get rid of carbon dioxide. Our heart rate goes up to deliver the oxygen to our brain and muscle tissues. There’s also a lot going on with our kidneys when we increase elevation. Have you ever noticed that as you get above treeline you have to go to the bathroom more often? Darn, no bushes to hide behind — that can get a bit tricky if you’re a girl (especially in the winter). Men have it made. Here’s what happens (to make a long, complicated story short). Your kidneys know you need more oxygen so they conspire to get rid of extra water so your blood becomes thicker and can carry more concentrated oxygen. Aren’t we just amazing little creatures?! All the more reason to honor our bodies and take care of ourselves. I’ll leave it at that and get on to the point of this post, which is about dispatch-blogging at super-high altitudes. I just wanted to set the stage as I often find it difficult to write a wimpy little post while sitting in my office, listening to music and sipping tea. Think about doing it on Everest. It’s hard enough just to breath, let alone create glorious dispatches such as these. I’m a Mac girl, so I love the idea that they’re using MacBook Pros to do their Himalayan blogging. I’ve been following the progress of this expedition and their daily dispatches since they started several weeks ago. I’ll explain why later and keep you posted as the team expects to summit in a few days. Go forth (or up) and have fun! I used to buy fresh coconuts, drill and hammer them into submission, save the milk, dig out the coconut meat with a 7 inch oyster knife and blend up my own coconut cream. Since I’m not an oyster fan, I bought the knife specifically for coconut excavation. I’ve only tried oysters a couple of times and it wasn’t a particularly good experience. Not that I would know, but they give me the sensation that I’m participating in a immunity challenge on Survivor Java and I’m trying to force down rhinocerus boogers or something. Ewww. Back to the point of this post, which is to highlight the beneficial properties of coconut oil. By the way, I no longer bother with starting from scratch with the coconuts as I quickly realized there were better ways for me to spend my time. Plus, with all those potentially dangerous tools I was fussing with, I was afraid I was going to injure myself in an attempt to stay healthy. Luckily there are some good coconut products available. First off, you need a jar of organic, cold pressed, centrifuge extracted, extra virgin coconut oil. Next, take a glob of it and work it into your hair, pile it on top of your head and hope no one rings your doorbell. Let it sit for a couple of hours, wash and rinse thoroughly, swing your head back and forth and admire the shine. I’ve been using coconut oil, milk, water, flakes, cream, powder and flour for quite some time now and I’m sold on its goodness. I’m not sure it’s the all-out miracle cure some claim it to be, but I do like it for a variety of reasons. I use coconut oil for all my sautéing and frying, regardless of what I’m making and surprisingly, it doesn’t impart a coconut taste to the food. I also use it in baking for its delicate taste and the “oily” moisture it provides to gluten-free baked goods. The type I use is made from fresh coconuts that are cold pressed into a milky emulsion, then chilled and placed in a centrifuge where the oil and water are separated. The finished product is unrefined, stable, pure and it tastes wonderful. I won’t bore you with too many details, but coconut oil is a concentrated source of medium-chain fatty acids (MCFAs), which do not require bile acids for breakdown. Instead of a process of emulsification and enzymatic activity in the small intestine, MCFAs are sent directly to the liver for processing. This is where sports nutrition, one of my interests, comes into play. MCFAs give your engine better gas mileage because they’re converted to energy more efficiently (and not stored as fat). I make little energy bars from coconut oil and several other ingredients that I take along on hikes. Like most of my food preparation, I make them differently each time, so I don’t have a reliable recipe. I’ll figure it out and do a post on it one of these days as I know from personal experience that they provide balanced energy for difficult endurance activities. 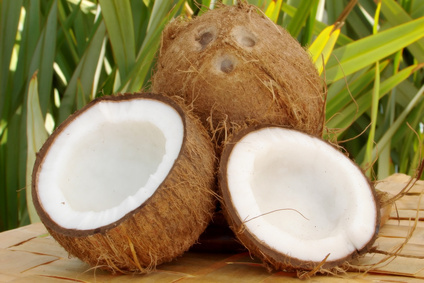 Coconut water is also filled with electrolytes, making it a good addition to homemade energy drinks and smoothies. Although there is lots of information suggesting coconut oil speeds metabolism by impacting overall thyroid function, I’d like to see more reliable scientific evidence supporting the link between the two. On to digestive health. Coconut oil is a saturated fat, but it’s a good one and plays a structural role in cell membrane integrity and works as a precursor to various substances that regulate intestinal motility. Blah, blah, blah — these fats are good ones and provide all kinds of benefits to the GI tract, boosting overall intestinal health and immunity. Remember, a large part of your immune system is located in your gut. Research also indicates coconut oil to have anti-viral and anti-microbial properties, so it’s a wonderful addition to a healthy diet. Coconut flour: naturally gluten-free, high in fiber, low in carbohydrate, good source of protein, high in good fat, adds rich texture and lends natural sweetness to baked goods. Replace up to 20% coconut flour in your recipe, you must also add additional liquid or it will be too dry. For a detailed post I did on fats and oils, please see do you need an oil change. 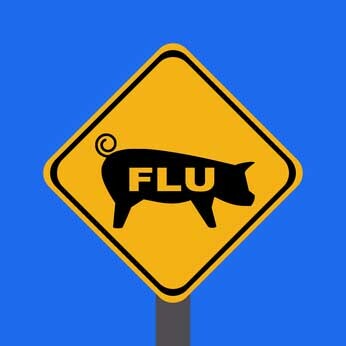 Swine flu has been all over the news lately with some reports sounding rather dire. While I’m mildly concerned, I’m not ready to follow Vice President Biden’s advice and stand out in a field by myself until the threat blows over. Aside from washing my hands more often, all I’m doing is avoiding sugar and sticking with my diet of fresh, wholesome foods. My intent is to keep my immune system tuned up and ready to launch an attack if I come into contact with any swine flu cooties. The WHO (World Health Organization) recently announced a serge in confirmed cases worldwide and Canadian health officials released information suggesting the first reverse transmission of the virus, from farm worker to pigs, so it’s nothing to sneeze at. Here’s a list of resources and links to specific information, all related to swine flu (H1F1 is the virus subtype). Heat oil in a large soup pot over medium heat. Add onion and garlic. Sauté for a few minutes and add ginger, carrots, celery, mushrooms, and burdock root. Continue sautéing — add a splash of broth if the pan becomes dry (a touch of broth is a great way to sauté veggies). Add all the chicken broth, diced chicken, brown rice and remaining ingredients. Cook for 30 to 45 minutes. Adjust as you see fit! 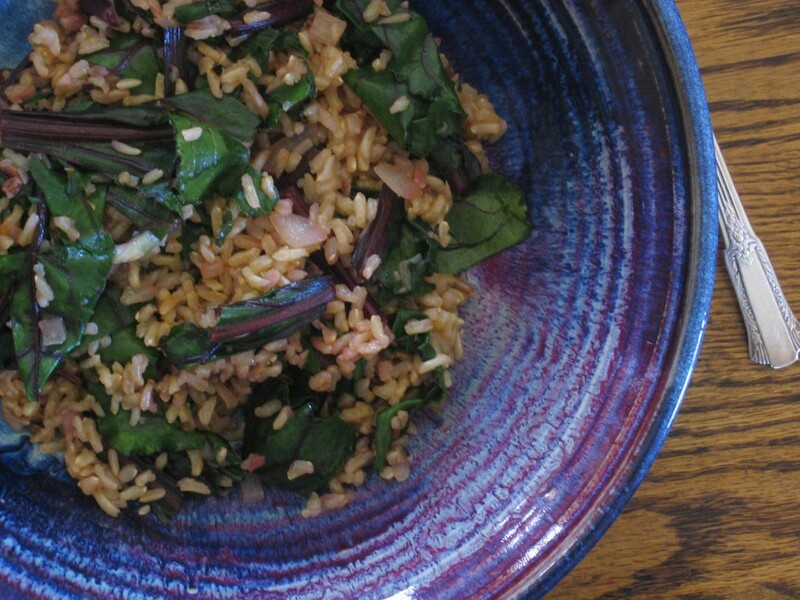 Replace brown rice with a chopped sweet potato, skip the ginger, add a finely diced jalapeno pepper — play with your food! Wash your hands, avoid cooties and stay healthy! It’s a bit like the difference between Pluto and Goofy. They’re not quite the same, but almost. Or maybe not at all. Hmmm? With the stock market tanking and the swine flu looming, maybe you haven’t given it much thought. That’s where I come in and save the day. I’m sure you’re quite curious and on the off-chance you have no clue what the difference is, I’m here to explain. And second, we’re food people, we need to know this stuff. Yams and sweet potatoes are two different vegetables, they’re not related. If you think you’re eating a yam, it’s most likely a sweet potato if you bought it in a US market. Yes, it’s confusing. Ah, but to enlighten us, the US Department of Agriculture requires all labels that feature the word yam to also include the word sweet potato. I love it when the government steps in to clear things up. To add to the confusion, sweet potatoes aren’t related to white baking potatoes at all and in New Zealand sweet potatoes are called kumara. In the ultra-abridged version of Hinduism, Kumara is the commander and chief of the divine army of the gods. He was also in command of an ancient version of Luke Skywalker’s lightsaber. Similar to Luke’s mission, Kumara used his mighty sword to slay ignorance (handy little device, swing away Kumara). How do I spiral from sweet potatoes to mystical weapons? I keep promising myself I won’t do that. And why is this sweet potato yam thing so confusing? Actually, it’s not. Here are the differences. A true yam is common in tropical climates (Africa, the Caribbean, South America) and contains more natural sugar than the sweet potato. The word “yam” comes from the African word nyami, meaning to eat. 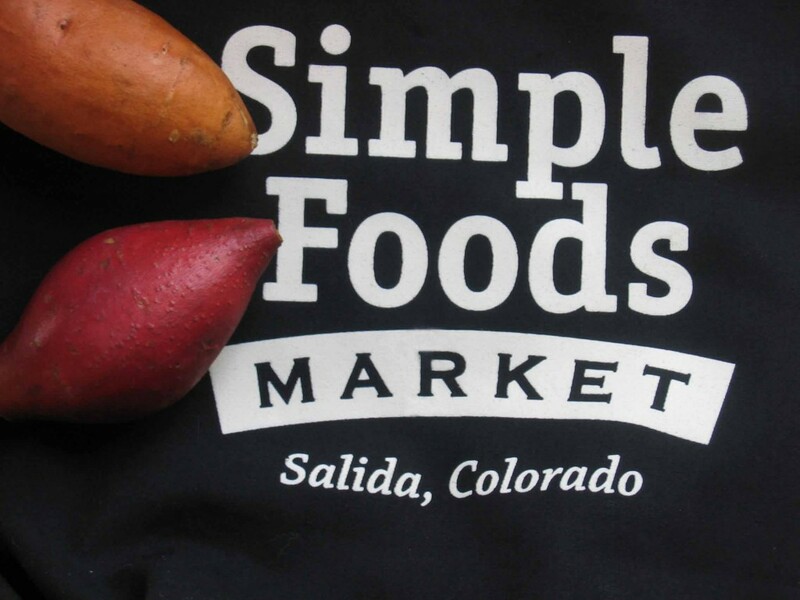 Yams aren’t common in traditional US markets, but you might find some in specialty markets. There are over 150 yam varieties available world-wide. We’re eating sweet potatoes if we’re using one of the two tubers shown in the photo above. Sweet potatoes vary in color from yellowish to dark reddish-orange (see my two picks above). The darker one is often wrongly called a yam. They’re both sweet potatoes although the lighter skinned ones are not as sweet and have more of a crumbly, dry texture. The darker, vivid colors contain more moisture and sweetness. I prefer using the red over the yellow sweet potatoes in my gluten-free baking. That way I can go with less added sweetener and also not worry as much about dryness. Those of us who have taken on the challenge of baking without gluten need all the help we can get and to be honest, I’d rather figure out some of my own tricks and tips using real food rather than the growing collection of modified starches and additives. Not only are they sweet and moist, they’re packed with goodness. 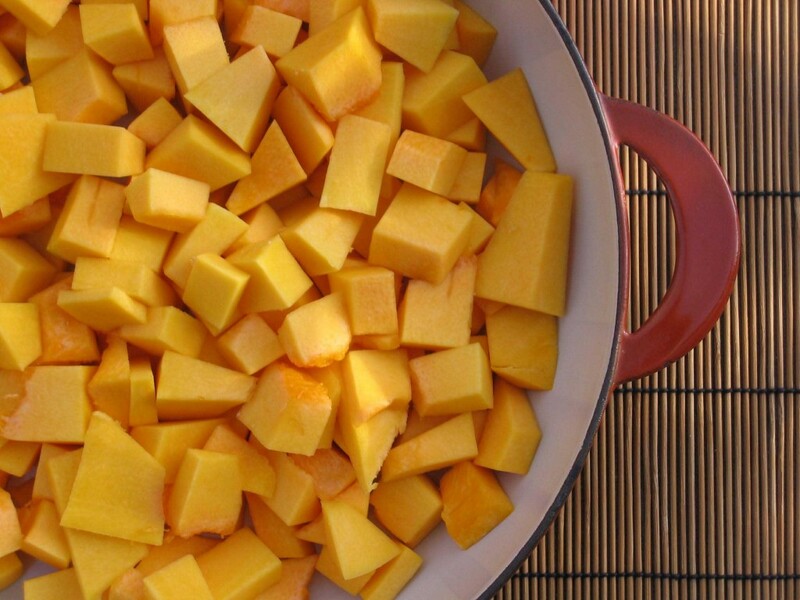 Sweet potatoes are a great way to get your sugar fix in a healthy way. Packed (260 % daily value) with vitamin A and rich in vitamin C, these vegetables are an excellent source of antioxidants. They also contain a unique storage protein that is high in antioxidant capabilities. * You can also use various spices such as paprika or ground cumin to add different flavors. Blend those spices in with the oil. Go forth and sweeten up your baking the natural way!